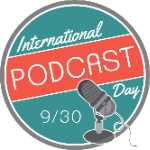 International Podcast Day – September 30- is an international celebration of the power of podcasts! Join the conversation and event by following and using #InternationalPodcastDay. There is National IPA Day, National Waffle Fries Day, National Pancake Day, and National pretty-much-anything-you-want Day. In the summer of 2013, Steve Lee (founder of Modern Life Network) heard a radio announcement for National Senior Citizens’ Day. Thinking that was pretty cool, it begged the question of why wasn’t there a day of celebration for podcasting. That’s when Steve said to himself , “Let’s create a Podcast Day!” So the adventure began and a collective team of podcasters put their heads together to establish methods for podcasters and podcast listeners to raise awareness for this great entertainment and education medium. International Podcast Day is focused on bringing more visibility to podcasting and promoting the growing digital media worldwide. The day-long event and celebration takes place each year on September 30. We have a collection of resources, information, and details throughout our site so be to to take the time and explore! In 2014, we held the inaugural National Podcast Event event and celebration, which trended on Twitter for fourteen hours. We provided live streaming for over 6 hours, which included call-ins from podcasters from around the country. Daniel J. Lewis held a Q&A session on Google Hangouts. We endorsed podcast meetups across the states by fellow world-renowned podcasters, including Dave Jackson’s Ohio Podcasters Meetup. Ray Ortega invited several podcasters to his Podcasters Roundtable. To conclude the day-long event, Paul Colligan hosted a YouTube tutorial for beginner podcasters. In 2015, we listened to the podcast community and re-branded to International Podcast Day. Between 2015-2017, we successfully streamed live for 100 straight hours, bringing in podcasters from nearly 55 countries including Australia, New Zealand, Thailand, Poland, Germany, South Africa, Jamaica, Spain, Argentina, Mexico, United Arab Emirates, Nigeria, Philippines, India, France, Switzerland, Scotland, UK, Finland, Canada, the United States, and more. Podcasters covered topics from automation tools to building listener communities and from creating local meetups to generating revenue for your podcast. The event trended on Twitter for several hours with over 150K tweets about the event. International Podcast Day was mentioned by New York Times, iTunes Podcast, Yahoo, CBS, and ESPN either on Twitter, in a company blog post, or during a live broadcast. We also sold several t-shirts which have been spotted at several podcasting conferences, both domestically and internationally. It is our intent to educate current and future consumers about podcasting and advance the podcasting discipline. We are continually looking to extend our reach beyond simply providing resources and tools to podcasters and connect the podcast listening enthusiasts with the event. Be sure to join the conversation by using #InternationalPodcastDay!